Colors: Black/white, red/white, fawn/white, blue/white, and even brindle/white. The American Staffordshire is a very muscular, stocky, yet agile dog, and is extremely strong for his size. He has a broad, powerful head, short muzzle, and very strong jaws. The ears are generally cropped, though this is optional. The eyes are round and black. The teeth should form a scissors bite. Its coat is made up of thick, short, shiny hair. All colors are admissible, but dogs must not be more than 80% white. The tail tapers to a point. The ears are erect and docked slightly. 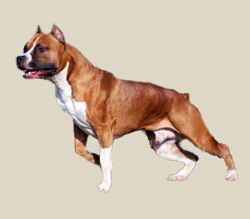 Classed by AKC as "American Staffordshire Terrier" and by UKC as "American Pit Bull Terrier." The American Staffordshire Terrier, are generally of larger bone structure, head size and weight then their cousins the American Pit Bull Terrier. Typically docile and playful with its family, the American Staffordshire terrier is also generally friendly toward strangers as long as its owners are present. It is generally very good with children. It is a protective breed and can be aggressive toward other dogs � especially those that challenge it. It is stubborn, tenacious and fearless. For all of its tough persona, the most important thing in life to this breed is its owner"s fond attention. The Staff needs a daily outlet for its energy, preferably in the form of a long walk on leash or a vigorous game in the yard. Though it can live outdoors in temperate climates, this breed is far better suited temperamentally to sharing its family"s home. Coat care is minimal. As one of the breeds popularly considered a "pit bull," public acceptance may sometimes be low. The smooth, short-haired coat is easy to groom. Brush on a regular basis with a firm bristle brush, and bathe or dry shampoo as necessary. A rub with a piece of toweling or chamois will make the coat gleam. This breed is an average shedder.